Welcome to Day #6 of Chocolate and Central America Week. We continue our geographic meandering—from Belize down to Costa Rica—with a final stop in Guatemala today. 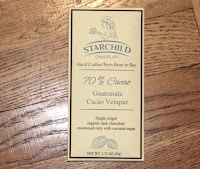 Today's 70% Cacao Guatemala Cacao Verapaz* bar was made (bean-to-bar) by Starchild Chocolate LLC (Willits, CA). This smooth, dark chocolate bar tasted like a fine cafe mocha vanilla latte lightly sweetened with coconut sugar. (There was no coffee or milk in this bar, just cacao, coconut sugar, cocoa butter and vanilla.) The combination worked; it yielded pleasing flavors with some depth but without bitterness. The vanilla used in this bar was more natural and flavor-forward than most, and it harmonized well with the unrefined coconut sugar, evoking a vanilla caramel aroma and taste without the over-sweetness (thank you!) normally associated with this combination. If you're located outside of California and you're interested in trying Starchild chocolate bars, they can be ordered online. If you stop into the Starchild Chocolate shop in northern California (Mendocino County), you may meet Ash and Brittany (Bree) Maki. The company makes all their bars without "gluten, dairy, soy, refined sugar or Gmos." 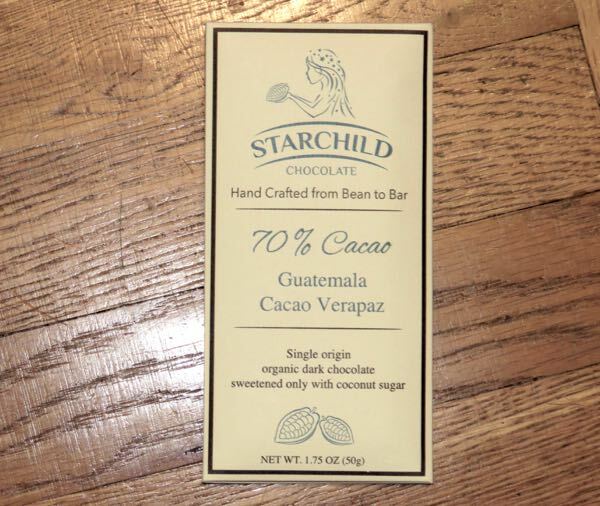 *Cacao Verapaz is an intermediary organization located in Guatemala, whose mission is to connect Guatemalan farmers' cacao with chocolate makers (like Starchild), with an emphasis on "positive social and environmental impacts in indigenous communities."